The Evacuscape Evacuation Chair is different type of equipment than I usually present here because it's not the type of equipment that many people would purchase for their own use. However, this evacuation chair is something that anyone who has a mobility impairment should consider having if they live in place where they would need to use stairs in an emergency. 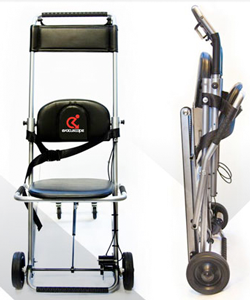 In an emergency where elevators can not be used the Evacuscape chair can make evacuation much easier and safer for those who are mobility impaired and can't use stairways easily. While the evacuscape products are not a product a user can use without assistance, it is something caregivers or emergency workers could use to make transporting a person down stairways much simpler. The Evacuscape Evacuation Chair is a lightweight narrow chair that a caregiver or emergency worker would transfer the mobility impaired person into so they can be rolled through a building and transported down a staircase quickly and comfortably during an emergency. 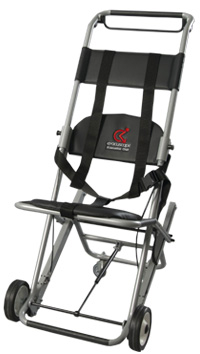 The use of an evacuation chair reduces the chances of injury for both the user and those assisting in their evacuation. Lightweight design (12 kg) and highly sturdy construction. 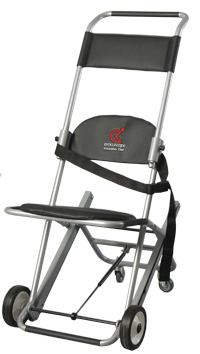 Equipped with safety straps and a padded seat and backrest for superior comfort and protection. Evacuscape's unique patented braking mechanism is designed for added safety and control in assisting PRMs safely and efficiently down stairs. Lightweight design (18 kg) and highly sturdy construction.